Hi All! I somehow managed to get two more quilt tops done this week in the midst of getting ready to leave for Austin! I’m so excited for this trip but also full of energy and inspiration to create! In addition to this quilt top I finished last week, I also sewed the last seams on my Dreamcatcher Quilt Wall Hanging. A few weeks ago, I came across this amazing quilt on Pinterest. And although I’ve seen many Lone Star type quilts over the years, this one especially caught my eye and I knew I had to create something similar of my own. 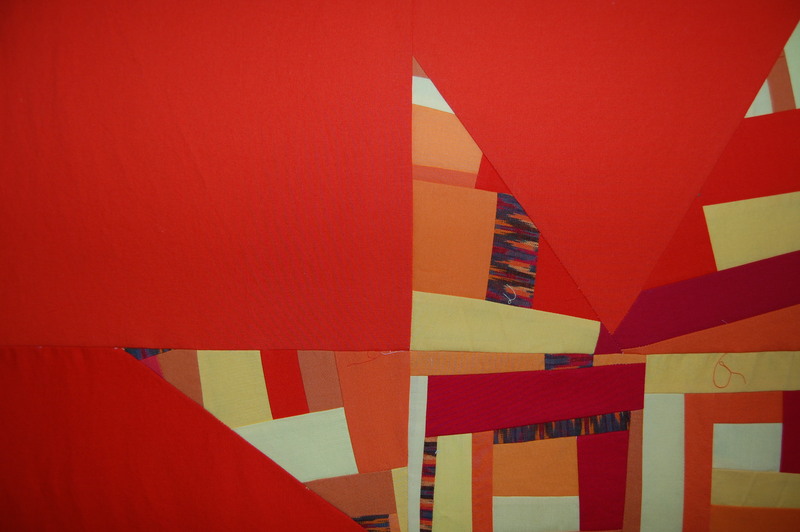 This one will finish out at 48 x 48, a nice little modern square wall hanging size. 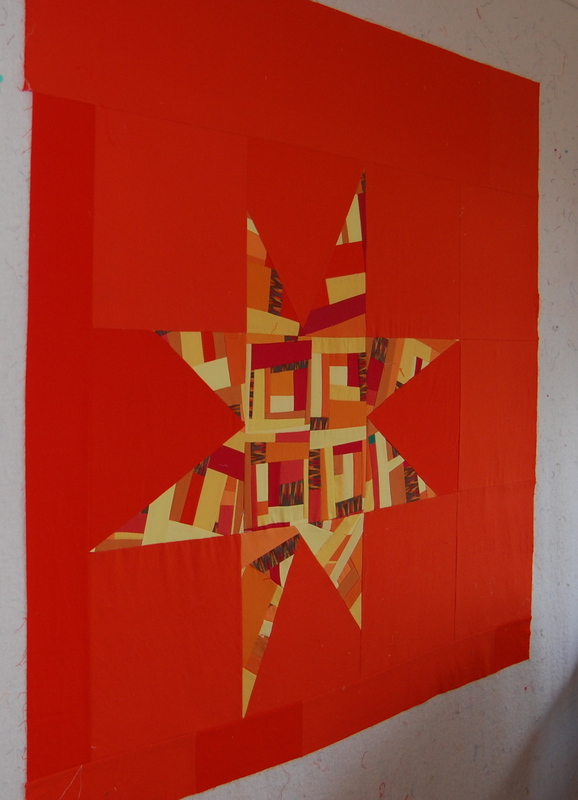 I was tempted to piece in some varying shades of orange on this one for the background but decided to use some restraint, figuring that there was already enough piecing going on in the star portion! It was fun using such a rich, dark color (Kona Tangerine) for the background; I generally stick with really light, neutral colors so this was definitely out of my “comfort zone”. I am considering options for quilting lines. My first thought was to straight line quilt echoing the 90 degree angle of the four corners of the star and repeat out in the negative space. But then I thought maybe that seems too obvious and expected…. but maybe it would look really great?? I’m hoping it comes to me during the basting session. Any ideas are always welcome! I also had fun finishing up this modern little square quilt using my Scrappy String Style HSTs from my tutorial I posted last week. 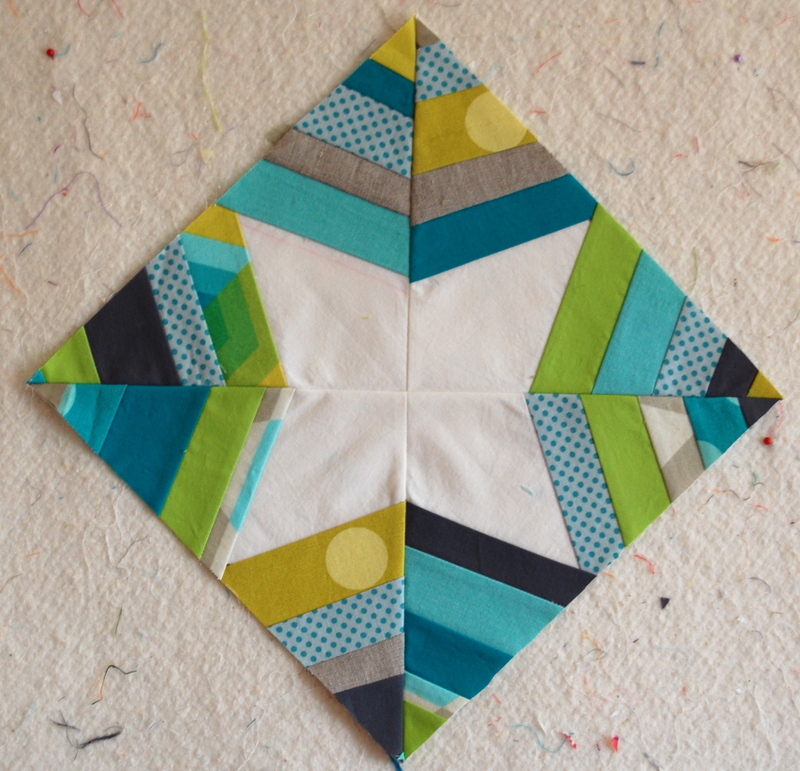 As I showed in my tutorial, there are a number of fun layout options with these HST blocks. I finally settled on this pinwheel variation. I think it will make a nice little baby play mat…. 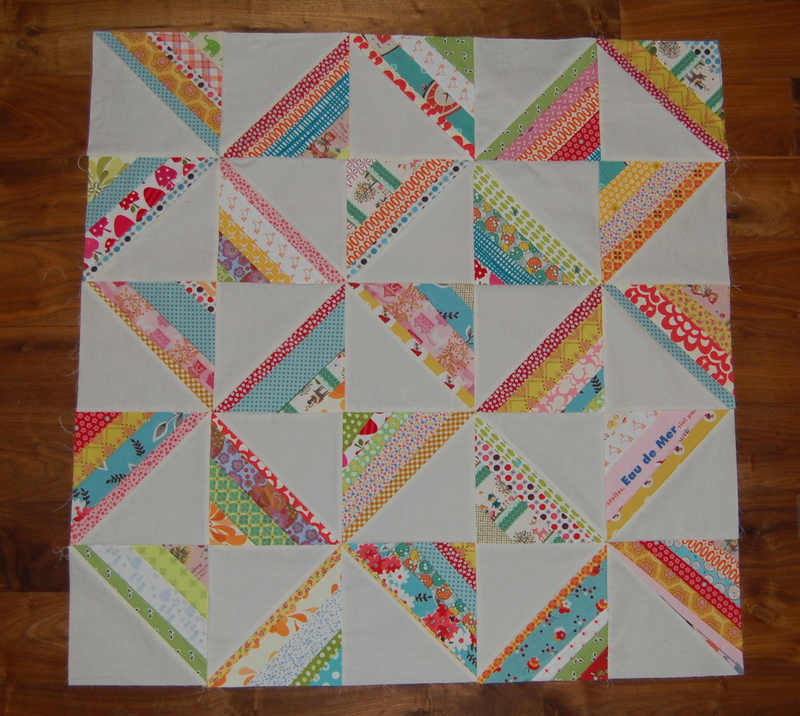 or I may decide to add some borders and turn it into a little lap quilt! I also just had in inkling to try another spiderweb block. I did some of these a few years back for my Christmas Tree Skirt. When I was working on it then, I remember thinking ‘oh this is so fun, I want to do this again’. Not sure yet where I’m going with this, but for me that is half the fun. Perhaps a pillow, small quilt, tote bag, etc…..(the color is pretty off in this photo, it’s really not quite that deep and dark, just had to add that in). Whatever it ends up being, it’s clear to me that I have plenty of “work” waiting for me when I get back from Austin! My next post will likely be from Quilt Con, although I may be having entirely too much fun to stop for that long!!! 🙂 I hope to meet a lot of you there! I’m linking up with Lee’s WIP Wednesday today….. as always, there is so much quilty goodness to see there. I love your lone star quilt! It’s incredible! And I love the orange you chose. So bold and cheerful! Have fun at Quilt Con. I am sure it will be amazing! Your spiderweb block is beautiful. I did two of those for bee blocks. Fun, but time consuming. wow, all these projects look amazing. so looking forward to seeing how you quilt them. Have fun at QuiltCon. Your star quilt is amazing. I love the colours. I love the pattern. I love the finished top. WOW. Great projects! I love the color theme in your spiderweb blocks. Always amazed at how much you seem to get done. Looks great. Crazy about your wild Lone Star on the fire engine orangey-red – it is art. Do you have a tutorial for that one on how you did the odd points to the star? and HUGE congratulations on your winning quilt at the QuiltCon!! !